A thoroughly addictive and entertaining read, Accumulation had me enthralled from the first page. I. Love. This. Book. 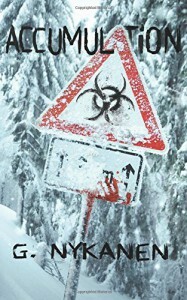 The writing, the plot, the cast of characters, the pacing...all of its elements came together perfectly and gave me a new book in the zombie genre to recommend to friends and family. When Accumulation begins, news reports are coming in about an infection spreading causing people to become violent and attack each other. People have even begun posting videos to YouTube of the attacks. Once infected, the victim goes through a transformation similar to that of a werewolf with the distinct sound of bones snapping. Then the victim lunges for whomever is nearby and eats them like a zombie. The governor, Steve Landis, is a madman and doesn't care about anyone surviving the apocalypse except himself. He was so calm and matter-of-fact about everything that it freaked me out much more than if he had been a raving lunatic. I think the bizarrely calm megalomaniacs are much scarier than the loud in-your-face ones. He has delusions of grandeur in thinking himself to be the commander-in-chief after having the bridge to the peninsula destroyed, cutting off access so no infected can cross into the area and to use up all the energy and resources for himself. The Riley family (grandparents, parents, kids, and uncle - they're a large family!) hides out together in a cabin the grandparents, Pop and Nan, bought a long time ago in case of a situation such as this. Totally great to have a conspiracy theorist in the family in times such as these! The dynamics of this family were really interesting and added tension to the story. One of the aspects of Accumulation I thought was so cool was how the large cast of characters start out separate and end up coming together in a realistic and believable way. Plus I really liked the unique twist on zombies - I wouldn't quite call the people who turn after infection zombies; it's a little more complicated than that with their strange transformation that always includes the body contorting in a way that should not be humanly possible. It's so creepy! Overall, Accumulation is a story about the world going to hell in a completely realistic way and in which the government can't be trusted to help its own people, which also seemed way too realistic. I kept thinking while reading this novel that I hope nothing like this ever happens and how much worse it would be to go through it with young kids. I was freaked out and yet couldn't stop reading - definitely a novel you shouldn't miss!